The recent penultimate pair of Rebels episodes, "Wolves and a Door" and "A World Between Worlds," revealed a new part of Star Wars mythology we've never seen before. It's something that could potentially change everything on Rebels, but also the movies - all while setting up a finale that will probably do just that. 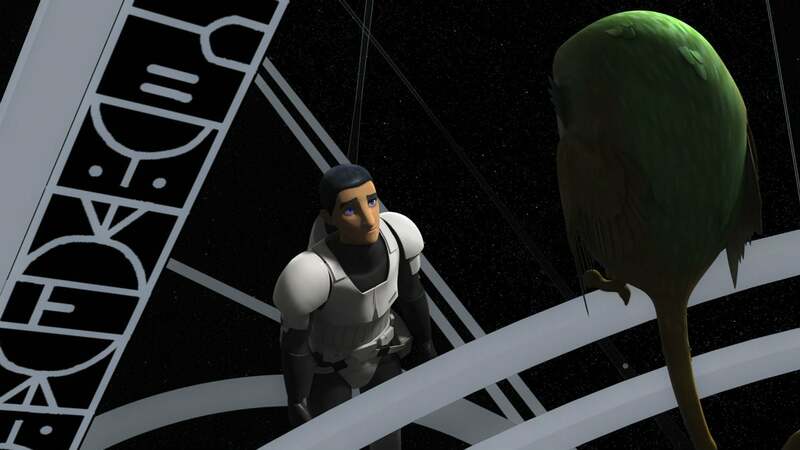 Ezra Bridger is about to change Star Wars as we know it on Star Wars Rebels. 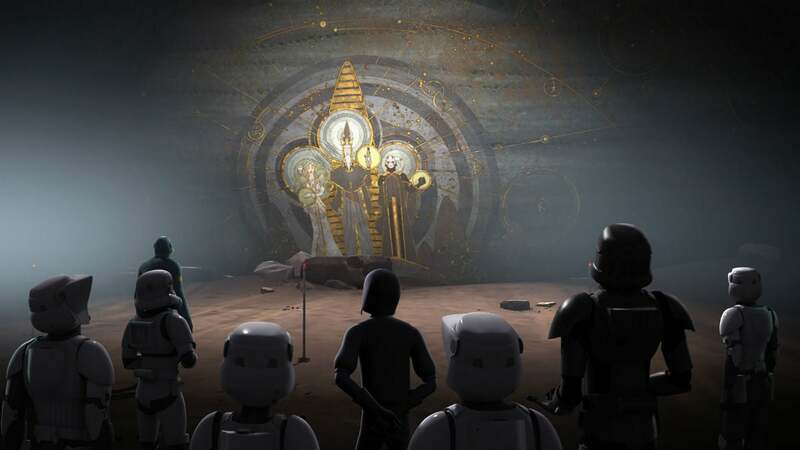 The episodes began with Ezra, Hera, Zeb, Sabine, and Chopper making their way across Lothal to its Jedi Temple, where Ezra believes he'll find some answers about Kanan's death. Once they arrive, though, they're greeted by a massive Imperial force led by a mysterious new character named Minster Hydan (voiced by the amazing Malcolm McDowell). 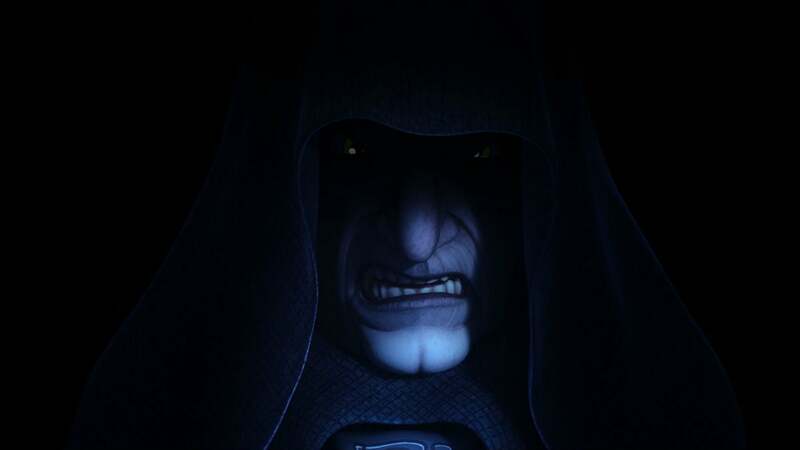 Hydan is some kind of Imperial historical authority on the Jedi and the Force, hired by Emperor Palpatine (voiced, once again, by Ian McDiarmid) to open this important temple and unlock some kind of massive secret. But, of course, only one person there can actually open it and his name is Ezra Bridger. The temple entrance, guarded by the legendary Mortis Gods. When Ezra opens the temple, it's a dark, mysterious place - a near infinite black with thin white lines delineating small passageways. And there are voices. Lots of voices. At first, these voices make narrative sense. Yoda. Obi-Wan Kenobi. Qui-Gon Jinn. Kanan Jarrus. Anakin Skywalker. All Jedi who have all existed before this moment in time. But then we hear Obi-Wan Kenobi talking to Luke Skywalker, and then Princess Leia - voices from the future. Then Rey. Yes, Rey. And Kylo Ren. Star Wars characters who won't exist in this universe for decades, but whose voices and actions already reverberate in the temple. What is this place? Outside it, Hydan explains to Sabine that the temple is a pathway to all time and space. Whoever controls it controls the universe, so it's no wonder Palpatine wants it. Inside, Ezra watches Ahsoka fight Darth Vader from Rebels two seasons ago, reaches back in time, and saves her from the falling debris of that temple. This place makes it possible for people to change the past. And it's out there, right now, for (almost) anyone to access. Ezra even almost uses it to try and save Kanan, which he could have, but Ahsoka talks him out of it, leading Ezra to a lesson we have let to fully grasp. And yet that's not all. Palpatine tries to capture Ahoska and Ezra in the temple but they both escape to their original time and places, with Ezra yelling to Ahsoka to find him. Then, right before everyone is captured, Ezra closes the temple, making it sink into the ground, inaccessible to anyone, including the Empire. At least for now. The implications of this are just too large to handle. It's way bigger than Luke Skywalker Force-projecting himself across a galaxy or Princess Leia flying through space. There is literally a mechanism in Star Wars where, if someone can access it, they can change the course of any and everything. It also raises the question, had Ahsoka been dead this whole time? Did the temple crush her and she was gone until Ezra reached back in time and pulled her out of the battle? 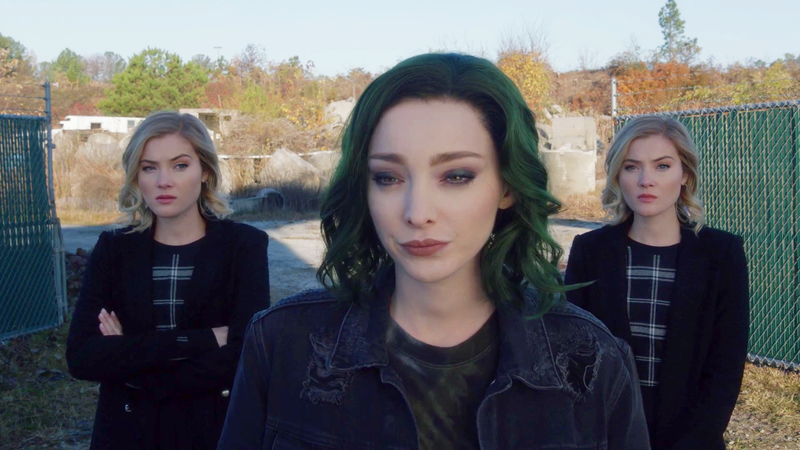 That would certainly explain her absence but, if that's true, wouldn't bringing her back suddenly change the events of the past two seasons? Or is it possible a future Ezra always saves Ahsoka in that moment after her fight with Vader? But if that's the case, where did she go after that moment? As is usually the case with time travel, there's a lot to unpack here. Dave Filoni never got to end his last series, The Clone Wars, on his own terms. He's finally getting his chance with Rebels, and he's not going to leave anything on the Dejarik table. He's exhibiting a penchant for storytelling as epic as anything we've seen in Star Wars so far.